If you’re in need of a celebratory chocolate cake recipe, this is the place to come. We are showcasing 26 chocolate cake showstopper recipes here on Tin and Thyme. They’re from a bunch of very talented food bloggers and you’re almost guaranteed to find something that you just can’t resist. 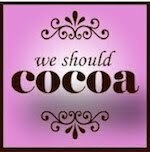 Bake off fans will no doubt be lusting after the incredible edifices produced by the GBBO contestants, but our very own We Should Cocoa showstoppers are up with the best and all vying to take centre stage. Thank you to all 26 participants old and new for celebrating We Should Cocoa‘s 3rd anniversary with such verve and style. Well my party piece for We Should Cocoa‘s third birthday is a real showstopper. It was so good, it stopped me in my tracks and knocked all sense out of me. As a result, I stupidly didn’t write the recipe down. Now a couple of weeks down the line, when I assumed all I had to do was put a few finishing touches to the post, I find I don’t have one and cannot remember how I made the cake. More importantly, I can’t remember what I put in it. This is really annoying as I do recall it was a particularly good one and I’d like to be able to repeat it. Note to self: pay attention and write recipes down immediately. The cake, pictured above, was a commission and a heart shape was chosen. As it was meant for a tea time treat, I was keen to use one of these Afternoon Tea Chocolates. Next month’s challenge is being hosted by Ness of JibberJabberUK, so be sure to take a look at her blog on 1 October to find out what the magic ingredient is going to be. Dom of Belleau Kitchen kicked these 26 chocolate cake showstopper recipes off in fine style. He only went and won the much coveted award of Best in Show at the Abbey Village Show for his stunning Summer Cake. Dripping with luscious fruit as it is, it’s hard to imagine anyone being able to pass this one by. Well done Dom. Adapting a much loved recipe from her university days, Johanna of Green Gourmet Giraffe baked this lovely dark vegan chocolate layer cake to celebrate We Should Cocoa and another of Dolly’s birthdays – it seems she has quite a few! Whilst not quite the one cake I asked for, I couldn’t help but include these stunning triple chocolate mini bundts. Stacy of Food Lust People Love has created a real showstopper or should I say showstoppers. Ruth of Makey-Cakey did a very clever thing with After Eights and two types of cake for Mr E’s Birthday Cake. It made me smile and I’m quite envious of the jolly party had by all at one of my favourite places, Arthur’s Seat. Temptress Gill of Pigling Bland was given the task of persuading an overseas work colleague to stay in the country by coming up with a cake so good they couldn’t resist. This rocky road chocolate cake was the result; it has seriously tempted me, I’m not leaving. After attending a class by The First Lady of Chocolate, Alice Medrich no less, Rebecca of BakeNQuilt created this masterpiece. Her Queen of Sheba torte is a chocolate and almond one and the icing stays miraculously shiny even after setting. It was great to see some seasonal produce being used and this Chocolate Courgette Cake has to be the most glamourous one I’ve ever seen. Elizabeth of Elizabeth’s Kitchen made this to celebrate several birthday events and my only concern is how is she going to distribute it to interested parties in Canada, Cornwall and Shetland? It appears no stops were pulled out for this celebration and Shaheen of Allotment 2 Kitchen has used real gold leaf to add an extra touch of show and luxury. She has thus given a second name to her vegan gold leaf and chocolate cake – Bling Bling Cake, which kind of says it all. The lucky recipent of this one was Shaheen’s nephew who was off to University for the first time. Chocolate overdose pie anyone? I think all of these entries could probably claim that title, but laden with chocolate biscuits, melted marshmallows and cream, this pie does sound seriously wicked. Maybe it’s just as well Kat of Life of a Cupcake Baker is too busy to blog so much these days. I’ve heard many a good thing about Paul A Young’s brownies, but I’ve not only never eaten one, I’ve never tried making one either – what have I been blogging about all these years? Claire of Under the Blue Gum Tree is not nearly as tardy and has made a brownie combining three of my favourite ingredients – chocolate, raspberries and butterscotch. My tongue was very nearly hanging out when I first saw this butterscotch raspberry brownie and I really think I need to do something about it. If ever you want to make a pink princess cake, hop over to Caroline’s blog Caroline Makes for a step by step guide. It looks terribly clever and most professional. I’m sure the recipient Ros of The More Than Occasional Baker was extremely pleased with her birthday cake. I regularly look forward to Susan’s entries from The Spice Garden, they are always so interesting and sound so delicious. Dense, moist, rich and gooey, this chocolate cake with milk chocolate crunch and caramel sauce is not likely to disappoint. This chocolate Guinness celebration cake from Ros of The More Than Occasional Baker was made for an Irish colleague’s wedding anniversary. She even made some very cute chocolate champagne bottles to decorate it with. It was voted as one of the best cakes Ros has made this year. Laura of I’d Much Rather Bake Than … had a very trying week and didn’t quite make the birthday cake for her flatmate that she’d originally intended. But the gluten free white chocolate and lemon giant cupcake which she came up with sounds fabulous. It contained white chocolate and her own homemade lemon curd. Now hold your breath, the clue is in the name. This triple chocolate star cake from Alexandra of The Lass in the Apron is not only elegant, but is a masterpiece of chocolate indulgence. You name it, it’s there – dark, white, milk, cocoa powder and not only that, it’s an eggless sponge too. A beautiful bundt is next to make it’s appearance. Jean of Baking in Franglais managed to find a bargain bundt tin and immediately used it to good effect to make her sister in law a birthday cake. Milk chocolate, toffee yogurt and crunchies formed the basis of the resulting milk chocolate and toffee cake. Chocolate cloud icing sounds so good. I haven’t tried it, but Janine of Cake of the Week is a big fan. She’s used it to make this moist and decadent Chocolate Chocolate Bailey’s Cake. Nat of Hungry Hinny brought back a few tips and tricks from last week’s Cake and Bake Show and wasted no time in putting them to good effect. This beautifully decorated black and white chocolate showstopper consisted of dark chocolate cake layered with white chocolate mousse and raspberry jam and was made for a friend’s birthday. Next up is a cake to celebrate a 13th anniversary as well as a 3rd. 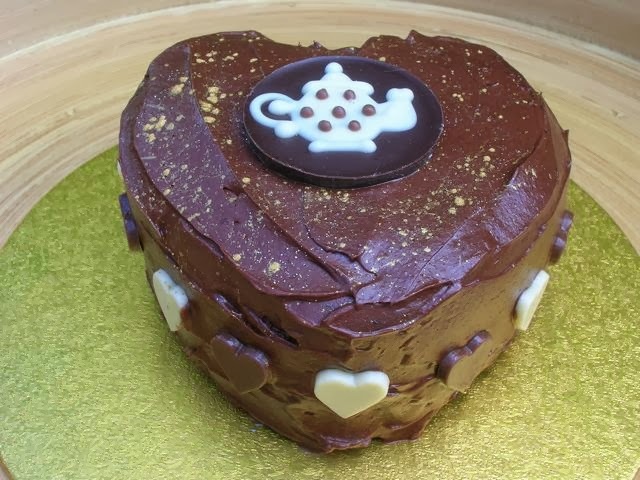 Erica of Tea With Erica must surely have had me in mind when baking this anniversary cake, for this dark chocolate layer cake is filled with salted caramel and just in case you weren’t already aware, this is one of my very favourite things. One filling was not enough for Erica though, a second fudgy walnut filling was also used and the whole thing was topped off by a dark chocolate ganache – mmm! This chocolate amnesia cake is my contribution to the 26 chocolate cake showstopper recipes. Except, there isn’t a recipe – oops! Other than remembering we made a small rectangular one just for the two of us, that it tasted very good and that I spent an inordinate amount of time whipping the ganache filling and topping, I am still no further forward in remembering how I made the cake. Louise of Eat Your Veg was under pressure to create a birthday horse cake for her pony mad daughter whose 5th birthday it was. Never having tried anything like this before, she saddled up her creative streak and achieved a chocolate cake showstopper to be proud of. September, it seems is a very popular month for birthdays. There was a 60th birthday to celebrate over at Corner Cottage Bakery and Hannah got busy in the kitchen to bake her mother a chocolate and vanilla layer cake. Hannah insists the artful stencilling on the top is quite simple to do; I remain impressed but unconvinced. With the theme of the GBBO in mind for her Clandestine Cake Club meeting, Jen of Blue Kitchen Bakes decided to adapt one of the early technical challenges. Instead of making Mary’s coffee and walnut battenburg (one that was, incidentally, made at this week’s Cornwall CCC), Jen branched out and made a chocolate and vanilla battenburg held together with white chocolate buttercream. For a right royal CCC, Jill of Lapin d’Or made this regal chocolate orb cake. Of course if it was a real orb sitting in the monarch’s hand, it would melt very quickly leaving unbecoming smears on the ermine robe. Luckily, this one is sitting on top of a rather delicious looking chocolate cake, so disaster averted and pleasure increased. Inspired by Vivienne Westwood, this has a punky edge to it. Lucy of The KitchenMaid went for a real heartstopper with this fabulous take on the antipedian classic pavlova. Her chocolate mousse cake contains copious amounts of chocolate and cream, ingredients without which life really isn’t worth living. And sadly, here endeth our 26 chocolate cake showstopper recipes. We hope you’ve enjoyed the show and found something you’d like to make. Wow !!! …. just Wow !!!! What a fabulous round up of showstoppers! There are some real stunners and I would be hard pressed to choose a winner if I had to play judge. Thank you so much for including my rules-defying mini Bundts. o my…so many stunning chocolate treats! I know where to look if I need to make an impressive cake! Great roundup as always, Choclette. There are some seriously stunning showstoppers here – the WSC-ers have done a fantastic job this month! A very fine selection of celebration cakes. Three years of WSC – can’t really believe it. I am in awe! What a collection of beauties! All wonderful. Here’s a challenge for you. A budget cake for under £1? Now that really would be a challenge. Expect I could do it if I didn’t use chocolate. I remember I used to make a jam cake which was pretty a pretty basic recipe but using a jar of homemade jam, so that might do it, especially if no eggs were used. Exactly what I expect cake heaven to look like! Well done everyone! Wow a really good selection of chocolate showstoppers here. Great round up as always. Happy birthday again to WSC and here’s to another great year! Oh my lord, they are seriously impressive cakes! Thank you all for your comments and good wishes and thank you again for all the wonderful entries. A fantastic round up! So many gorgeous cakes in one place, wowie! !